Snuffy dresses like a cloud for a play! Boo! Elmo and friends sing a song about celebrating Halloween on Sesame Street. Help your child make up silly words that rhyme with her name. For example, you might rhyme Carly with Darley or Starley! How many silly rhyming words can you come up with? Bert does his pigeon dance. Grover learns about tie dying t-shirts. Diana Krall sings with the muppets. 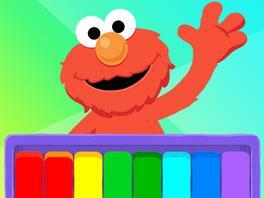 Make music and play instruments with Elmo, Abby, Cookie, and Oscar! Create your own family band using items from around the house, like empty oatmeal containers and wooden spoons. Sing favorite songs together as you play your instruments!